a. General. 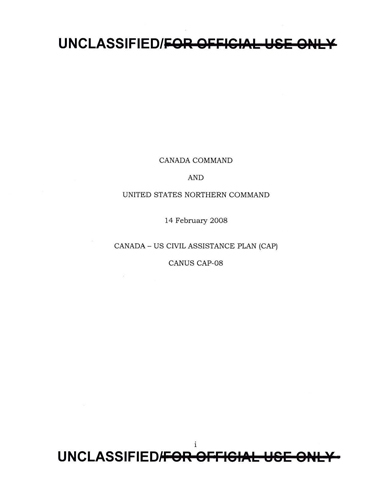 The purpose of the Canada-United States Civil Assistance Plan (CAP) is to provide a framework for the military of one nation to provide support to the military of the other nation in the performance of civil support operations (e.g., floods, forest fires, hurricanes, earthquakes, and effects of a terrorist attack). (I) Support covered under this plan will only be provided when agreed to by appropriate authorities in both the Government of Canada and the United States Government. (2) When approved, military forces from one nation augment the other nation’s forces in civil support operations. Support under this plan is not provided directly to civil authorities, but rather to the other nation’s military. (3) Support for law enforcement operations is not covered in this plan and will be included in the Canada – United States Combined Defense Plan (COP). (4) Guidance and direction to develop this plan is derived from the Canada – United States Basic Defense Document (BOD) , 08 July 2006 (Ref 1D. This plan may be used alone, or concurrent with the Canada-US Combined Defense Plan or other national plans. The Commander, Canada Command (Comd Canada COM) and Commander, US Northern Command (CDRUSNORTHCOM) are the designated planning agents for the development of this plan. b.Federal Coordination of Emergency Response. The Canadian Department of Foreign Affairs and International Trade (DFAIT), acting on behalf of the Government of Canada (GoC), and the US Department of State (DOS), acting on behalf of the United States Government (USG), will, upon receipt of a formal request for, or offer of mutual assistance, coordinate an agreed upon bilateral response that may include military support. (1) In the United States, coordination of foreign assistance for a disaster in the United States is conducted per the International Assistance System Concept of Operations. c. Area of Responsibility (AORl. AOR is defined as the common areas of responsibility for Primary Agencies (Public Safety Canada (PS) and Department Of Homeland Security (DHSII, and the Canada -US (CAN US) Region (i.e., Canada and the Continental United States (CONUS), Alaska, US Virgin Islands, and Puerto Rico, including each nation’s territorial seas). d. Opposing Force. Opposing forces are not expected during the conduct of operations described in this plan. However, when planning and conducting operations where the military forces of one nation are supporting the military forces of the other nation that are conducting civil support operations, commanders should consider the following Anti-Terrorism/Force Protection issues: (1) Terrorists organizations could conduct operations against the Canadian or US force, or in the civil support operations area; (2) State/provincial and local police capabilities could be severely degraded in the area of operations, allowing a corresponding rise in criminal activity that could affect the Canadian or US force; and (3) Environmental factors ranging from weather to contamination and disease could significantly affect the Canadian or US forces. requests for international military assistance. (b) Public Safety Canada (PS)’ The Minister of Public Safety is assigned primary responsibility within the GoC to coordinate the federal response in crisis and consequence management situations within Canada. (cl Department of National Defence fDND) / Canadian Forces (CF)’ The CF may, upon request, provide support to PS, other federal departments and agencies, provincial/territorial and municipal authorities pursuant to the National Defence Act (NDA), or other legal authority. Comd Canada COM is the responsible CF operational commander within the Canada COM AOR defined as Canada, the continental United States, Mexico, and the maritime approaches to North America. (a) Department of State (DOS). The Department of State is responsible for coordinating with other nations for disaster assistance, including military assistance. (Ref 31). (b) Department of Homeland Security (DHS). The Secretary of DHS is the principal federal official (PFO) for US domestic incident management. (c) Department of Defense (DOD), In accordance with the National Response Plan (Ref 3k) DOD may, upon request, provide support to DHS and other federal agencies for domestic Defense Support of Civil Authorities (DSCA). Upon Secretary of Defense approval, CDRUSNORTHCOM is the supported combatant commander with responsibility to coordinate defense support to federal agencies within that portion of the United States within CDRUSNORTHCOM’s AOR. (1) Requirements for military support of civilian authorities could be fulfllied by either nation’s military. However, the nation providing crossborder military support will not fulfill these requirements directly to the other nation’s civilian authorities, but rather to the other nation’s military. (2) Operations will typically occur in a permissive environment. g. Legal Considerations. The United States and Canada are Parties to the North Atlantic Treaty Organization (NATO) Status of Forces Agreement (SOFA), dated August 23, 1953. (a). Canadian Forces (CF!. In Canada, as per Canada Command Direction for Domestic Operations (Ref 2i), local commanders are expected to respond promptly to a request for assistance, within their approval authority, by providing an immediate CF response to an emergency to save lives, prevent human suffering, or mitigate property damage. However, for foreign disaster assistance, the GoC must approve the request. (b). US Armed Forces. In emergency situations the SecDef can provide foreign disaster assistance in order to save human lives, where there is not sufficient time to seek the prior initial concurrence of the Secretary of State. The SecDef shall advise, and seek the concurrence of the Secretary of State as soon as practicable thereafter (Ref 3b). (a) Only the President may order US military forces to execute foreign consequence management missions. DOS is the lead agency (Ref 4D. (b) When directed by the President or by the Secretary of Defense, with the concurrence of the Secretary of State, DOD provides foreign disaster assistance support in coordination with DOS. DOS is the lead agency (Ref 3b and 4g). (a) CF Rules of Engagement (ROE), If ROE are required for CF personnel deployed in the United States to support the US forces engaged in Defense Support of Civil Authorities, the ROE will be requested by the Canadian commander and authorized in accordance with B-GG-005-004jAF-005 dated 2001-06-01 Use of Force in CF Operations (Revision 1) . (b) Standing Rules of Engagement ISROEI for DOD forces. Implementation guidance on the application of force for mission accomplishment and the exercise of self-defense is contained in (Ref 4d). DOD forces will be trained on SROE before employment. (a) Canadian Forces. Both international law and Canadian domestic laws recognize the authority to use appropriate force in self-defense, up to and including deadly force. Without further written or oral direction, CF personnel are entitled to use force in self-defense to protect oneself; other members of the Canadian Forces; and non-Canadian military personnel who are attached or seconded to a Canadian force against a hostile act or hostile intent (Ref 2c). (b) US Forces. US unit commanders always retain the inherent right and obligation to exercise unit self-defense in response to a hostile act or demonstrated hostile intent (Ref 4d). (5) There are no standing CANUS rules of engagement or rules for the use of force. Consequently, every mission will require unique guidance to deployed forces. Forces from one nation deployed to support the forces of the other nation will comply with authorized ROE and right of self-defense consistent with the laws of the supported nation. The ROE and right of selfdefense will be designated in respective national operation / execute orders. suffering, and reduce great property damage. Every effort should be made to maintain situational awareness of these existing bilateral civilian regional planning groups to ensure support to the other nation’s forces is effective and efficient. (1) Command Relationships. Bilateral support described in this plan will occur under existing structures and command authorities. Command relationships for supporting forces will be defined based on the circu.mstances of the operation and delineated in respective national operation and execution orders. coordinating assistance to civil authorities. Regional Joint Task Force Commanders (RJTF Comds) exercise OPCON of forces assigned by Comd Canada COM for the execution of an operation. In Canada, OPCOM is the authority granted to a commander to assign missions or tasks to subordinate commanders, to deploy units, to reassign forces, and to retain or delegate operational/tactical command or control as may be deemed necessary. OPCON is the authority delegated to a commander to direct forces assigned so that the commander may accomplish specific missions or tasks that are usually limited by function, time, or location; to deploy units concerned and to retain or assign tactical control of those units. If the requirement develops for separate employment, the higher commander must approve the change. (Ref 2y). (b) United States. CDRUSNORTHCOM exercises operational control (OPCON) of all allocatcd US forces ness CDRUSTRANSCOM). In the United Stales, OPCON is command authority that may be exercised by commanders at any echelon at or below the level of combatant command. OPCON is inherent in combatant command (command authority) and may be delegated within the command. (Ref 4ii) . b. Command. Control. Communication and Computer fC4J Systems. As directed by the BOD, Canada COM and USNORTHCOM will ensure network enabled capabilities to enhance information sharing, collaborative planning and rapid decision making to support bilateral operations described in this plan.